The engine has a low maintenance dry centrifugal clutch.The following prescriptions, if carefully followed, will allow a long clutch life. When starting the engine make sure that the brake pedal is fully pressed to avoid sudden accelerations. ATTENTION: Once the engine is started, avoid useless accelerations which can overheat and deteriorate the clutch. Oil the chain before each tests, immediately after each race or test, check the engine sprocket. Replace if necessary. A bad alignment of the engine sprocket with the axle sprocket or the lack of oil will damage the chain and sprocket. Every 5 hours of use. When metallic noises are heard inside the clutch. If the kart dragging speed exceeds 6000 RPM. Every time the clutch has overheated (presence of smoke or smell of burning). To check the clutch, you must remove the clutch cover and the clutch drum. whenever the thickness of the friction material (see drawing) is lower than 1.5mm on point A of the clutch or if the body diameter is lower than 82.5mm. 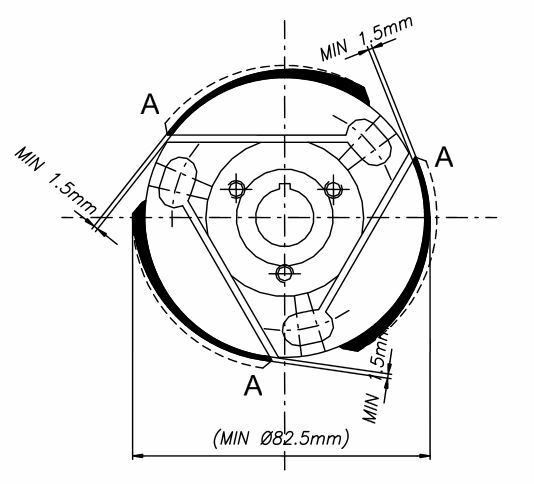 whenever the external friction material in the A portion of the clutch is very rough (wear or degradation of the friction material due to overheating). ATTENTION: In case the friction material has been totally worn out and there has been a metal contact between the clutch body and the clutch drum, it is necessary to replace the clutch drum. See drawing. ATTENTION: The following operations can be performed by a skilled mechanic under the conditions to have available the dedicated tools shown on the text, otherwise it is necessary to apply to an Authorized Service Center. Refer to the following drawing during the operations. Remove the external washer, the drum with roller bearing, the internal washer. Remove the special tool from the head and using the clutch wrench, remove the 16×1 nut and the cone safety washer. Clutch wrench : P.N. 10270. 24 mm socket. ATTENTION: Turn clockwise as nut has left thread. Apply clutch puller on clutch and remove clutch with 19mm socket. Clutch puller: P.N. B-55614-C. 19mm socket. Before assembling the clutch, wash with diluent the shaft taper, the connecting hole on the clutch body, the clutch drum and the starter ring. Install the starter ring on the clutch body by matching the 3 holes and the dragging pin. (3 screws M6) 10 mm socket (Torque at 10 Nm) (90 in-lb) (Apply Loctite on the threads) ATTENTION: make sure to always install the Ø 7 mm dragging pin as, otherwise, the eventual kick backs could break the screws. Install clutch body and the cone safety washer. Install the internal washer. ATTENTION: install washer with bevel towards internal part of the engine. Clean the roller cage and grease it before installing on the crankshaft. Install the clutch drum and the external washer. ATTENTION: install washer with bevel towards internal part of engine. The life of an engine depends upon many factors but most of all upon the speed at which the engine is operated. If an engine is normally operated at speeds higher than what recommended by the manufacturer, the wears and stress of the various components (con-rods, roller cages, bearings etc.) will be such as to drastically reduce the life of the engine itself. It is therefore extremely important that the user respects the operating limits imposed by the manufacturer. The operating limit for the Leopard engine is 15000 RPM. ATTENTION: Never exceed the above limits. No obligation of IAME exists in case the above limits are exceeded. In case the user wishes to optimize on the track the sprocket ratio in order to achieve the best possible performance, without abusing the engine, follow the under shown recommendations. The engines are supplied with a 10 or 11 teeth sprocket (pitch: # 219). 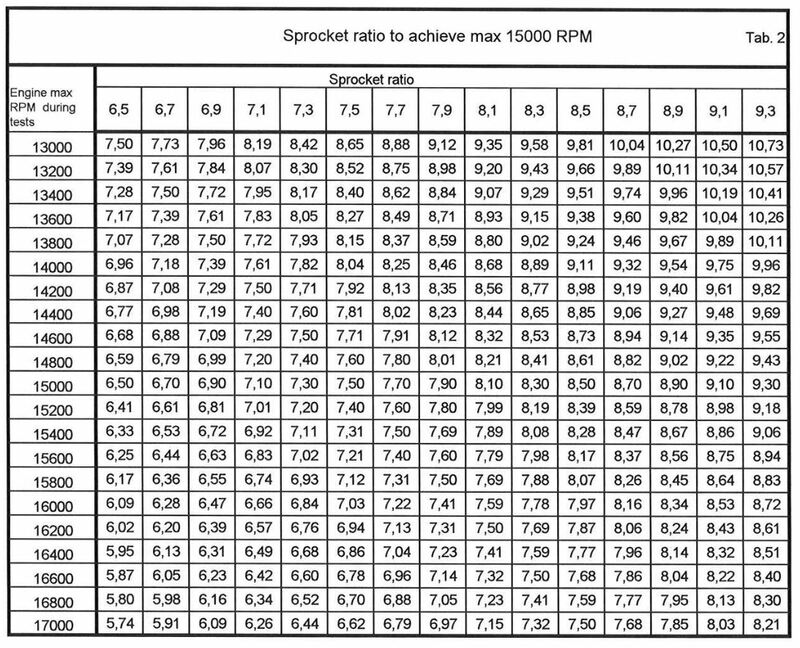 Table 1 shows the various ratios between the sprocket on the axle and the engine sprocket given the different axle sprockets. For the operation limit of 15000 RPM the following table (Tab.2) has been prepared. During the track tests we recommend use of a tachometer recording the max obtained engine RPM. Use sparkplug caps with a resistance of 5KΩ to avoid eventual interferences between the engine ignition and the tachometer and/or telemetry. The following example should clarify the procedure for the optimization of the sprocket . Assume to use the engine with Z=10 teeth engine sprocket and that during the preliminary track tests a Z=72 teeth axle sprocket has been used. From table 1 with Z=10 as engine sprocket and Z=72 on the axle sprocket, a ratio of 7.20 is found. Make a few laps on the track and, let us assume that you read 14.000 max engine RPM. From the table 2 to achieve a max RPM of 15000 RPM (operating limit for the Leopard engine) a sprocket ratio from 7.61 and 7.82 should be used (having used, during the tests, a sprocket ratio of 7.2 and having achieved 14.000 RPM max.). 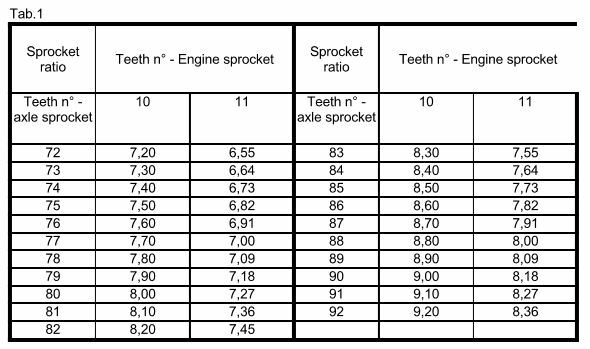 From table.1 , with these values, a sprocket ratio of 10:76 / 10:78 should be used or, having a Z=11 on the engine sprocket, a ratio 11:85 should be used.